This is an excellent class for beginners, or anyone who needs a refresher course. Students will select from over a dozen designs including hummingbird, butterfly, coyote, dove, canyon sunset, and more to make one copper foil panel. 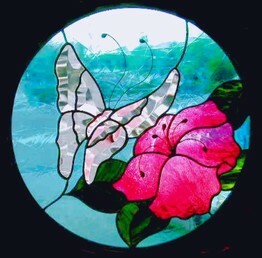 Copper foil is the most popular stained glass method, allowing for intricate and delicate designs, as well as strength in 3-D work such as lampshades, boxes and kaleidoscopes. We will cover template making, glass cutting, grinding, foiling, soldering, patina and finishing techniques. This class provides a great foundation for learning more advanced techniques, and is a prerequisite for our intermediate, leading and lampshade classes.